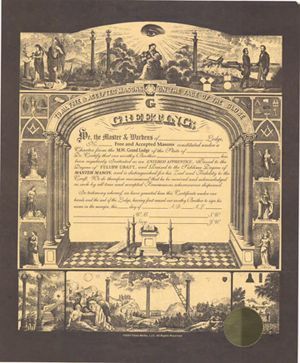 F. & A. M. Master Mason Certificate: This impressive and highly detailed F. and A.M. reproduction Master Mason degree lithograph depicts over 70 Freemasonry symbols. 1. Lodges wishing to honor their newly raised Master Masons with an affordable, memorable and educational keepsake. 3. As a gift presented to recognize and honor 50 year members, Past Masters, and special member achievements. This is truly a beautiful certificate which you can proudly display. Freemason symbols include the Eye of God, the Working Tools, the Virtues, the Mosaic Pavement and Columns of Solomon's Temple, the 3 Lesser Lights, the Holy Book upon the altar, the Good Samaritan, Jacob's Stairway to Heaven, Meetings upon High Hills and Low Vales, Boaz and Jachin, Steps of 3, 5 and 7, the Lambskin Apron and many more. Paper: 28# Gold parchment. Also includes a Gold Foil Seal for imprint with your lodge seal stamp. Quantity Discounts: Save 10% on an order of 5 Certificates. Save 20% on orders of 10 Certificates or more. Discounts will be calculated in your cart when you check out. Copyright: Fenix Media, LLC. All Rights Reserved. Certificate may not be reproduced in any form.